Anyone ever do this when ascending 13 or 14ers? My guess is most people don't unless they're actually climbing with rope and stuff. My concern is more so to protect yourself from careless people above you or in a short fall. For example, I hiked South Arapahoe Peak last year which the route we took was only listed as a class 2 so this never seemed necessary. However we took a few poorly chosen routes up and down near the top that were probably closer to 3 and there was plenty of loose rock that could have tumbled if people were careless above us. Definitely some areas where it we fell it would have been no bueno. Always better to be safe than sorry. If there is the possibility of continuous falling it’s probably not the worst idea to wear a helmet but I’d say roping up if you have more than one partner is a safer thing to do if your in route that has a no fall zone. If your with a friend and both wear a helmet and one of you fall in a no fall zone, Great you/ partner survived the fall but you fell 2000 ft and you break your legs. What’s the plan? I’d say the question to ask your self is are you on a simple hike or are you mountaineering? If your on any thing that could result in multiple broken bones I’d say your mountaineering. 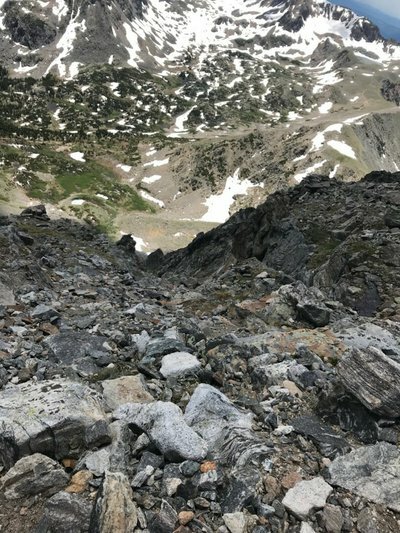 There’s a lot of people in Colorado who go climb some of the 13s and 14s that shouldn’t be there because they just arrived/ have no skills in the mountains. Research before you go and have a plan for situation A,B,C is something you need think about if your starting to climb bigger and more dangerous mountains. When I started hiking bigger mountains I bought the hikers/mountaineering/climbing bible Freedom of the hills. It’s a must read for anyone spending significant time on anything considered a mountain. Honestly anyone living in the mountains should have to read it. If it's steep and loose enough for rocks to be potentially tumbling down toward your head then sure. I throw in a helmet if I know there's going to be some scrambling and I'm not likely to be the only one on a given mountain. I don't wear a lid skiing but if I was in some sketchy and unstable terrain I think a helmet would be a good idea. Could only imagine taking a basketball size rock hurling down a mountain to the dome. That being said I dont see myself rushing out to buy one. JoeF2661 I don't wear a lid skiing but if I was in some sketchy and unstable terrain I think a helmet would be a good idea. Could only imagine taking a basketball size rock hurling down a mountain to the dome. That being said I dont see myself rushing out to buy one. If you’re touring wear a climbing helmet because it has great ventilation, just wear a beanie under. PArkciTyutard If you’re touring wear a climbing helmet because it has great ventilation, just wear a beanie under. Yea I'm going to buy a helmet this off season. I'm half way to a retard anywho from slams and crashes. Got to protect those precious few brain cells I have left. 50Kal If there is the possibility of continuous falling it’s probably not the worst idea to wear a helmet but I’d say roping up if you have more than one partner is a safer thing to do if your in route that has a no fall zone. Yeah man I feel you. I wouldn't say it's mountaineering but more of an aggressive hike/climb. Maybe it is mountaineering idk. I'm all about preparing and usually overpack with enough supplies and knowledge to spend more than a few days if I were to get lost. For example, I'm probably the 0.001% that carries bear spray in CO lol judge me. I'm more of the paranoid, better be ready for anything type of person. Thought about bringing a helmet last year but opted against it, however there were a few moments where I realized it would have been a good idea. We only saw 3 other people who summited that day so traffic wasn't bad. It blows my mind when I hear people didn't bring enough water or other basic supplies and end up dying on hikes. Most people we saw had maybe, if any, a single tiny daypack per group. I agree too many people fly or drive in and hike these trails in jeans with literally 1qt of water and a sandwich. Sounds like the helmet question is a yes from most. Yeah I think a helmet would be worth it if you find yourself doing hikes like that a lot. I don't climb (like rock climbing with ropes) but I do a fair bit of scrambling and there has definitely been moments where it would be let me have a bit more piece of mind. There's a few hikes around Alberta where helmets are strongly suggested due to the amount of traffic above you in rocky sections.